Q. 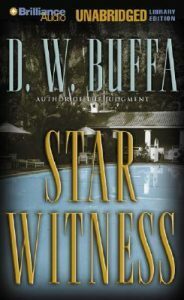 What inspired you to write about the sensational Hollywood trial in Star Witness? I wanted to write a novel about the power of celebrity and the power of the public opinion on which celebrity depends, and to show how the public, or at least a part of it, comes to think what it does. I wanted to write a novel in which, because the victim of a murder is a famous movie star everyone thinks they know, everyone is quickly convinced that the man accused of her murder, her husband, celebrated himself as the most powerful man in Hollywood, must be guilty. I wanted to write a novel in which the defendant is able to convince all those same people that he must be innocent by making a movie in which everyone can see for themselves what actually happened the night his wife was killed. Q. What was your inspiration for this? I first got interested in writing a novel about Hollywood when after an interval of many years I read for a second time F. Scott Fitzgerald’s The Last Tycoon. Fitzgerald based the central character on Irving Thalberg, the legendary director of what is frequently called the golden age of Hollywood. It is a story about unfinished dreams, about the desire to do something better than it has been done before. Star Witness is about the same thing. Stanley Roth, the most powerful man in Hollywood, has won an academy award for best picture and he has the leading studio in town, Blue Zephyr, the studio he always wanted. It is not enough. He wants to do something great. He wants to make a picture as good as, or better than, the greatest picture ever made. He wants to make a picture as good as, or better than, Citizen Kane. He wants to be as good as, or better than, Orson Welles. Stanley Roth is willing to risk everything, including even the chance that he might be convicted of murder, if only he can do that. Q. Do some of the characters in Star Witness come from people you have known or read about? Stanley Roth is not based on any actual person in Hollywood or anywhere else. In a strange way, Roth is based on another fictional character, not the last tycoon of Fitzgeralds invention, but the narrator and protagonist of Star Witness, the defense lawyer, Joseph Antonelli. Roth shared with Antonelli the knowledge that comes with being the best at what you do: the knowledge that it is not good enough, that there is something missing, that there is something more you have to do. They are, both of them, driven by a kind of restless uncertainty about the value of what they do. Antonelli defends people whom he knows are guilty and should be in prison; Roth makes movies that bring in millions and teach nothing of importance. They are better than what they do and it is the only thing they know. The conversations they have with each other are in certain respects the reversible monologues of two eminently discontented men. There are strange, fragmentary things that seemed to stick in my imagination that then found their way onto the written page in the form of minor traits or small gestures in some of the Hollywood characters. Warren Beatty’s half-open mouth when he waits for a question, and Grace Kelly’s cool and lovely, distant eyes, and Gregory Pecks enveloping laughter, were among the things that echoed in my mind. I also knew some things about the old Hollywood through a friend of mine whose father had quite a lot to do with the formation and great success of MCA, the company that under first Jules Stein and then Lew Wasserman once controlled much of what happened in Hollywood. Q. Why set this next novel in Hollywood? The novel is set in Hollywood because Hollywood the motion picture industry has become the center of the American mind, the place that draws everything toward it and shapes the way we think and the way we look at the world. There is a reason why more people now want their children to grow up to be movie stars than want them to become President. It is Hollywood, not the White House of the halls of Congress, where you will find the power to change what people believe. Stanley Roth, accused of the murder of his movie star wife, uses that power to change what people think about him. Q. What are some of the things you loved about practicing criminal defense law? Strangely enough, what I liked were the things that are closest to what it is like to make a movie. There are certain similarities between producing and directing a movie the way Stanley Roth does and defending someone charged with a crime. When you try a case to a jury, you tell a story, you try to show them make them see what happened, or what did not happen. The members of the jury never see the crime for themselves; the crime has already happened. They see it through your eyes, the way a movie audience sees the story through the eyes of the director. The obvious difference of course is that at the end of the movie the audience goes home; at the end of the trial the defendant may go to prison or to his own execution. Q. What were the things you feared and /or disliked about practicing criminal law? I loved trying cases; I loved the intensity, the single-minded concentration on everything said, the instant decision to ask a question or not to ask, to object or not to object; the knowledge that whatever you did, you had to do it now and there would not be a second chance. I hated the long sleepless nights that started days before the trial began, when all the things that could possibly happen start running through your mind like some endless movie that just when you think it is over, adds yet another new scene. Q. Why are there no great courtroom movies in your opinion? During a fairly heated exchange, Joseph Antonelli tries to explain to his client, Stanley Roth, why there have not been any great courtroom movies. He suggests that movies like Witness for the Prosecution were really more about the mystery of who committed the crime than what goes on in a criminal trial. He tells Roth that a great courtroom movie would not be about the accused, but about the lawyer, the lawyer who has a case no one thinks he can win, a case in which all the evidence points, or seems to point, to the defendant. Without any evidence of his own, he has to take the evidence offered by the prosecution and somehow convince the jury that it does not mean what the prosecution says it does. He has to convince the jury that the evidence does not prove guilt beyond a reasonable doubt. Show someone doing that, show someone making that kind of argument, insists Antonelli, and you will have a great movie. Roth is intrigued, and he makes a movie about a trial, his trial, but it is not the kind of movie Antonelli had in mind. It is not about the argument on the evidence, it is about new evidence, a surprise revealed through a camera lens. But then, it was Stanley Roth, not Joseph Antonelli, who was considered a cinematic genius. Q. What in your legal experience has influenced Joseph Antonelli? Antonelli is famous, successful and rich. He is a much better trial lawyer than I ever was. We do, however, share certain definite character flaws. Antonelli has a remarkable capacity for self-delusion. He seldom fails to convince himself that a jury has to find a client, any client, not guilty because, despite sometimes overwhelming evidence, Antonelli can find that one mistake, that one error, which will supply a reason to doubt. Antonelli never looks at note to remind him what to say at the end of a trial when he argues the case to the jury. He loves bringing a skeptical jury over to his side and he knows that one of the ways to do this is to make them believe that everything he says comes straight from the heart, though most of it comes instead straight from his memory. Antonelli cares only about winning. The only cases he hates are the ones in which the defendant is innocent, because then someone else will have to pay, perhaps with their life, for any mistake he makes. He wins cases he should have lost, and because of it can never quite escape the nagging doubt that something is not quite right and that the law, instead of an instrument of justice, is at best a kind of necessary fraud. Most of D.W. Buffa’s books are available on Kindle and paperback.